What’s that? 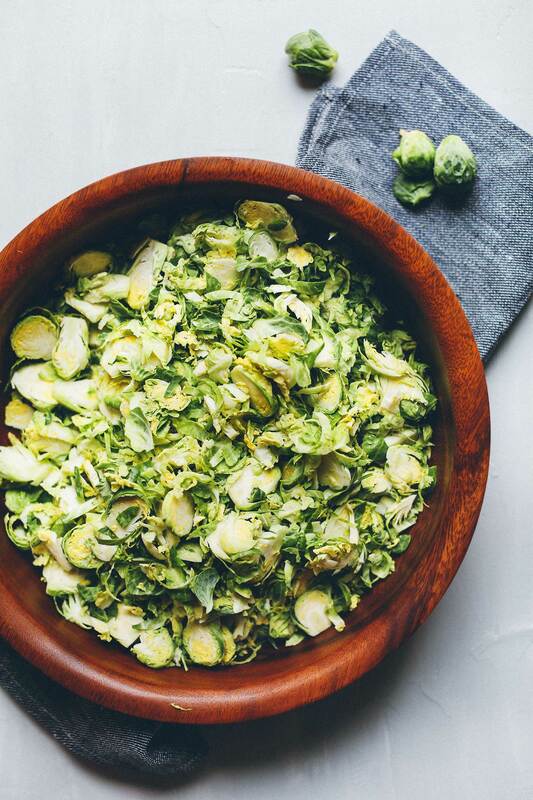 We need yet another reason to love Brussels sprouts more than we already do? (Yes, we totally do). 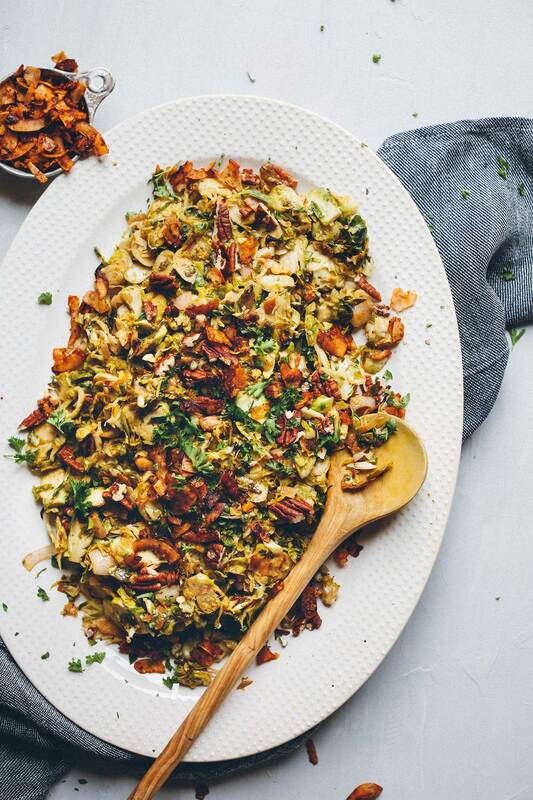 Presenting a warm and savory Brussels sprout slaw that screams winter, is über comforting, and is quick and easy to make. This recipe requires just 30 minutes and less than 10 ingredients to prepare. 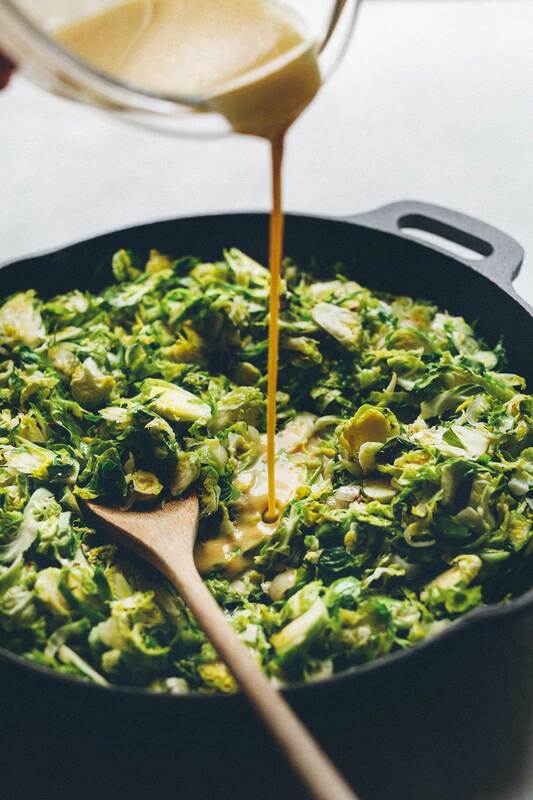 The base is shredded Brussels sprouts, which are tossed in a tangy, slightly sweet mustard sauce. Hubba. 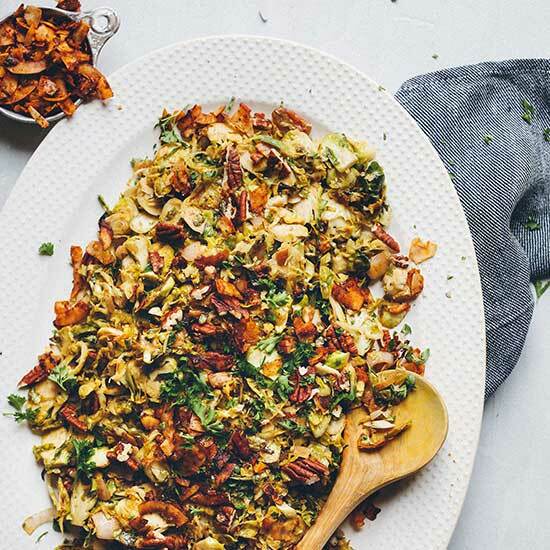 Pecans add nuttiness and a little protein, while coconut bacon (!!) adds a lovely crunch and saltiness to the dish. This was admittedly my first time trying coconut bacon, and I was super impressed! I played around with a couple of recipes and developed my own version. Find it here! Coconut bacon doesn’t quite have the texture of bacon (unless you like yours super crispy), but it does mimic the flavors quite well! It’s perfect for adding to salads, sandwiches, and warm slaws like this one. This would make the perfect side dish to bring along to parties, or it would pair well with mains like my Portobello Steaks with Avocado Chimichurri, Creamy Fall Soup in Acorn Squash Bowls, or Best Vegan Pulled Pork Sandwich. And if you love Brussels sprouts, be sure to check out my Garlic & White Wine Pasta with Brussels Sprouts, and Crispy Brussels Sprouts with Sriracha Aioli! A warm side dish perfect for fall or winter. 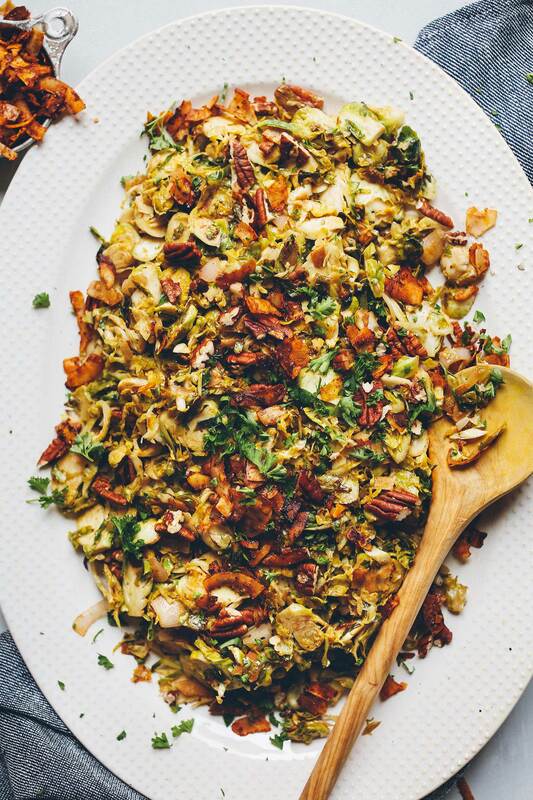 Brussels sprouts, pecans, and coconut bacon are tossed in a tangy mustard dressing! 30 minutes and 100% plant-based. If you haven't toasted your pecans or made your coconut bacon yet (optional), do so first. Toast pecans by roasting in a 350 degree F (176 C) oven for 10-15 minutes or until golden brown. In the meantime, trim Brussels sprouts and very thinly slice with a knife or use the sliding disc on your food processor to thinly shred. Add sauce ingredients to a small bowl and whisk to combine. Set aside. Heat a large, rimmed metal or cast-iron skillet over medium heat. Once hot, add oil and shallot and sauté for 3-4 minutes or until soft and slightly caramelized. Add Brussels sprouts, stir, and cover. Sauté for 3-4 minutes, stirring occasionally. Remove lid and add sauce, pecans, and coconut bacon (optional). Continue cooking for 3-4 minutes more, stirring occasionally, or until Brussels sprouts are tender and slightly caramelized. Serve warm as is or garnish with freshly chopped parsley (optional). Best when fresh, though leftovers keep covered in the refrigerator up to 4 days. Reheat on the stovetop or in the microwave until hot. *Recipe loosely adapted from Paleo Comfort Food. This has now officially become my go to recipe for potlucks! I’ve made it with the mustard dressing and also with your tahini dressing and everybody loves it, even people who usually don’t like brussels sprouts! We are so glad you enjoyed this recipe, Frederique! We liked this, but honestly the result was closer to a sauerkraut than a slaw. Next time we’re going to make it with far less time on the stove. This was fantastic!!! I made it as a side dish to a soup dinner. The flavor profile of the tangy dressing and the savory/crunchy coconut bacon and toasted pecans was PERFECT! This was my first attempt at homemade coconut bacon and I was happily surprised with the outcome; very easy to throw together. I used sweet yellow onion instead of shallots as that is what I had on hand, and it was great. Thanks so much for the killer recipe! Will definitely make again. Just made this. It is AMAZING! I swapped smoked tofu in pace of the coconut bacon and it was really good. Will definitely make again. Seriously YUM!!! I brought this to Friendsgiving and everyone loved it! Wow, you really are a genius with plant based cooking!!! I changed to wfpb diet after cancer treatment and your recipes and cookbooks are brilliant and help me feel really well. made the Brussels sprouts slaw and the dressing is so delicious on salads too. Just made the coconut bacon as I did not have time before…SO SO DELICIOUS 😋, could eat this by itself. Thanks so much for making it easier to be creative with plants! So kind! We are glad you enjoyed this recipe, Stephanie! So good! We made this as one of the side dishes for my dad’s birthday party, no one thought that they liked brussel sprouts until they tried this recipe. Thanks so much for a beauty recipe, will definitely be making again. Wow, that was amazing! I ate way too much on accident. I did both coconut bacon AND pecans because I couldn’t decide. 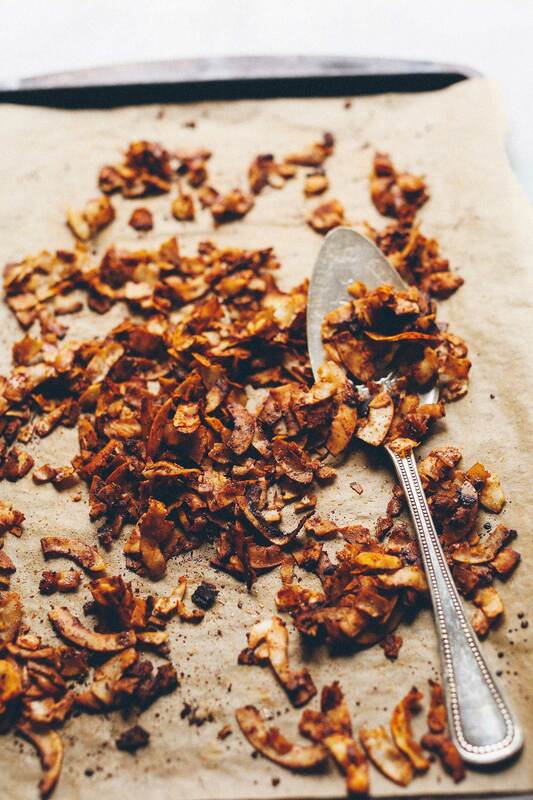 I make the coconut bacon with smoked paprika instead of liquid smoke. Thank you for your recipes! made this tonight and it was excellent! can’t wait to make it again. thank you for your fabulous site/recipes. i actually feel very thankful for you. Made this for dinner tonight. Absolutely loved it! Used agave instead of maple syrup and kale slaw instead of brussel sprouts. Delicious!! 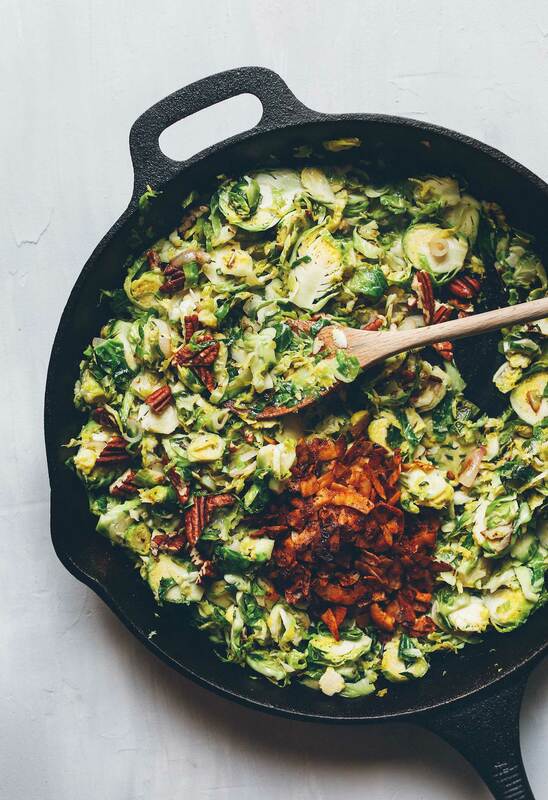 I am one of brusselsprouts biggest fans (and now coconut bacons also!) With that being said, I think I would’ve enjoyed this recipe much more if I hadn’t added the bacon in with the warm sprout mixture. I found that it softened the bacon too much and stole all the flavor from it as well. Other than that the flavor was amazing and the pecans and shallots completed the slaw! Thanks for all your creative recipes! I made this without the coconut bacon because I didn’t have any large flake coconut sitting around. I am also allergic to pecans, so that was omitted. It was so good, even without. My husband and I loved it! I have since made the coconut bacon, and daaaaaang! I will have to make this again with those yummy little addicting bits of goodness. Minimalist Baker, you rule the world! I can’t get enough of your recipes! Pretty good! I would wait until serving until you put the coco bacon in because it got soggy and tasteless when I cooked it in with the sauce/sprouts. This looks so amazing, I am dying to make it! I don’t live in the US and havent seen liquid smoke anywhere here so need someone to bring it. I saw you mentioned you have another vegan bacon recipe coming soon, does it also use liquid smoke? Should I get the ball moving on getting some? I made this last night, I was hoping I’d find it as addicting. So many textures! Unfortunately, the dressing was just way too vinegary and acidic for me, it completely masked the flavors of everything else. Love the idea though, thank you, I will be shredding more Brussels Sprouts and making a muted mustard vinaigrette! I fried a couple of eggs in the same pan at the end- delicious. Thanks for the recipe! I loved this❣It was incredible, like a comfort food. I just found this site, thanks to The group Becoming Minimalist. I love to cook quick healthy meals, looks like I just scored big finding minimalistbaker? Just made this and am eating it as I type and it’s DELICIOUS! I didn’t know where to get my hands on liquid smoke, so I replaced the coconut bacon with fried capers. Turned out great! I absolutely adore Brussels sprouts, and this looks utterly amazing. What a fantastic combination of flavors and textures. I had some time this morning, so I decided to make this…now I’m eating it for breakfast! It is AMAZING. SO SO GOOD! I didn’t make the coconut bacon, but I may try that next time. This is flavorful and so satisfying, and it comes together so quickly. It will definitely be going into the regular rotation at my house! Thank you!!! PS I have been alternating between your quinoa gado gado bowl and roasted vegetable/quinoa harvest bowl for lunch every day and have been loving them both! How do you come up with so many incredible recipes each week?! Simply incredible. Literally the best thing I’ve ever eaten, vegan or otherwise. Oh my goooooodness this looks phenomenal! Cannot wait to try the coconut bacon!! I’ve just tried brussel sprouts for the first time these past 6 months, and I love them! Excited to try this recipe. Also, is that white dish from West Elm?? I think so, yes! Good eye. This sounds deeeee-licious. Can’t wait to try that mustard sauce – YUM! Oh this sounds perfect! I love your addition of pecans! I never would have thought of that. Lovely blog, recipes and pictures! Gorgeous photos and fabulous recipe! Can’t wait to try. I made coconut bacon and found it had a very strong coconut aftertaste that I found really unpleasant. I ended up throwing it away. I wonder if I perhaps the dried coconut pieces I used were not fresh or if I did something else wrong. I love coconut, but the stuff I made was really awful. Hi Susan! I find coconut bacon best as an additive to things like salads and sandwiches. I don’t LOVE it on its own, but it does give the crispiness and flavor of bacon. But if you’re not a fan, sit tight! I have another vegan ‘bacon’ recipe coming soon. Wow! You’re fast :D Glad you liked it!